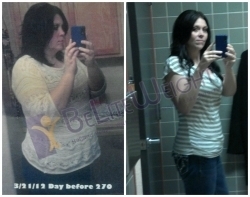 My name is Angela, I have been over weight my whole life until BelightWeight helped save my life. When I say saved my life, I really mean it. I was so depressed that I didn’t even want to leave the house. One day searching around the internet I ran across the BeliteWeight's website. I was skeptical about going to Tijuana for anything, let alone surgery. After talking to my facilitator Ishi, I decided that is what I wanted, no needed, to do. Family and friends tried to talk me out of it but I told them I was doing it no matter what, I had already made up my mind. My surgery date was scheduled for March 22, 2012. My mom went with me and when we arrived everything went pretty fast. They did the testing that they needed to do and got me ready for surgery. I met a lot of really nice people. I started freaking out a little bit that I had to go to this extreme just to be a normal weight. Everyone there was very comforting and I even got a visit from Joanne, which shared her story with me. After talking to her, I was convinced this is what I was doing and they took me in to surgery. After I woke up there was minimal pain, which they helped to control quite well. The Dr.’s and the staff were awesome! I had my surgery on Thursday and stayed in the hospital until Saturday morning, and then they drove me to the hotel, which was beautiful!! The staff there knew just what I needed and helped me all along the way. Later that afternoon one of the Dr.’s came to my hotel room to check on me and change my bandages. I don’t know about you but I have never had a Dr. come to me and check on me after I have left the hospital in the states. My experience all together was a great one. This was the best decision I ever made and don’t regret it for one minute. I am 6.5 months post op and down 104 lbs*. So if I could leave you with one thing, it would be, if you know this is what you want, go for it!